The legend of Zorro was played out in several serials. In some serials, Zorro was present in only the title, such as Zorro's Black Whip, where Zorro makes no appearance. 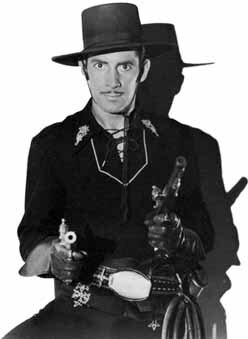 Reed Hadley stars in Zorro's Fighting Legion. But in this serial, Zorro's Fighting Legion, Zorro takes a starring role. It's one of the best Zorro serials and one of the best serials ever made, period. With Reed Hadley alternately playing the foppish Don Diego and the man of action Zorro, Zorro's Fighting Legion gives us one action-filled, edge-of-the-seat cliffhanger after the next. For your money, these are some of the best cliffhangers ever made, and with William Witney and John English in charge, also some of the most believable. Rarely do the cliffhangers cheat when extracting their hero from danger. You'll find more wit in the cliffhanger solutions of Zorro's Fighting Legion than you'll find in all the serials combined released after 1950. Zorro's Fighting Legion has the ingredients of a western, but it never really feels like a western. The locale is vaguely exotic, Mexico, just after the end of the Spanish Revolution (circa 1810). One of the great problems of western serials was their lack of variety. Once locked onto the prairie it was hard to supply any surprises other than the usual galloping horses, gun battles over rocks, and the occasional exploding cabin. But Zorro's Fighting Legion contains some unusual ingredients. For starters, we get the secret cave of Don del Oro. The Yaqui Indians treat him like a god. And indeed he looks like a walking, talking golden idol. He sits on a throne with the Yaquis at his feet, while his thunderous voice booms out his orders. And in the middle of the cave, a fiery pit of death awaits all who cross Don del Oro. But the most impressive creation of this serial is the person of Zorro himself. Reed Hadley was always a rather stiff actor, but this role suits him well because Don Diego is supposed to be pretending that he's a fop. ("Thinking bores me," he says when offered a position on the town council). So we go along with his not quite convincing performance because he's not supposed to be entirely convincing, or else we might actually start wondering about the actor himself. Hadley strikes just the right mixture of fop and daredevil. He's no Douglas Fairbanks or Tyrone Power, the two actors most closely associated with Zorro, but he gives us one of the better characterizations in the history of the serials. Before taking the role of Zorro, Reed Hadley had virtually no experience riding horses, fighting with swords, or cracking a whip, but you might never guess it from the serial. Zorro emerges as an expert with a whip. He uses it to extract himself from several life or death situations--such as the cliffhanger that ends Chapter 1: Zorro appears to be trapped in a landslide. Rocks and dirt fall in a cloud of debris. How can he escape? Well, that whip's not just for cracking at his foes. 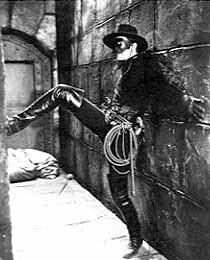 And in another chapter ending, which contains one of the very best cliffhanger solutions in the history of serials, Zorro is trapped in San Nicholas Mission. He knows a bomb is ready to explode. He knows he has only seconds to escape. But he's trapped by the Yaquis who are firing at the exits. Carrying an unconscious friend over his shoulder, Zorro runs up the stairs, looking for a way out. What can he do? Where can he go? The camera cuts to a long shot of the mission. Suddenly, an explosion rips it apart. How could our hero survive? Typically serials would have the hero suddenly run out of the mission, suddenly oblivious of the enemy gunfire (or maybe the solution would show the enemies suddenly retreating). But, no, Witney and English have more respect for their audience. (SPOILERS coming in the next sentence.) In this case, Zorro slings his whip over a beam, and with his unconscious friend over his shoulder, he swings through a stained glass window. He shatters the window and swings right toward the camera! Neither is Zorro a slouch with a sword. Several times, he takes on several Yaquis and defeats them all. In Reed Hadley's hands, Zorro becomes a believably wicked sword fighter, as when he slices a "Z" on the forehead of a particularly nasty sword-fighting foe. But Zorro usually attempts to avoid any unnecessary bloodshed. In one scene, he strips the buttons from his foe's pants until the pants fall to the floor. Or in another chapter, he pins an opponent to a wooden beam by throwing a knife and pinning the opponent's sleeve. Zorro is also a top notch horseman. In Chapter 4, Zorro spurs his horse forward in a thrilling jump over a chasm--a frequently used scene in previous westerns, but still exciting nonetheless. The western influence would also be felt in some of the other action scenes. One of the scenes contains a famous stunt by Yakima Canutt, the great stunt man who worked on so many of the Republic serials. In Chapter 7, Canutt (standing in for Reed Hadley as Zorro) attempts to stop a stagecoach. He rides alongside the horses pulling the stage and jumps onto the back of the lead horse. Then, with bullets whizzing past his head, he swings between the horses and begins to work his way back to the stagecoach. He slides under the stagecoach, climbs up the back, and punches out the driver. If this scene sounds familiar, it should. Steven Spielberg stole this stunt completely for Raiders of the Lost Ark, where the stagecoach is replaced by a truck, which Indiana Jones overtakes in a similar fashion. See Yakima Canutt's stagecoach stunt, an excerpt from Zorro's Fighting Legion. 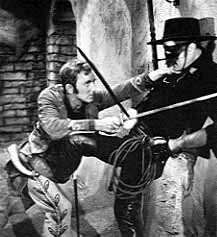 Unlike the strictly utilitarian camera angles you'll find in most serials, Zorro's Fighting Legion contains some startling images, such as the aforementioned scene where Zorro crashes through a window. Other impressive images include a shot up a mine shaft as a runaway elevator plummets toward the camera--and toward Zorro, who's trapped in the shaft! Or try one of Zorro's leaps across a chasm: the camera is placed at ground level so that Zorro's horse can kick up dust into the camera as it lands and bounds away with Zorro. Witney and English consistently chop up spaces with a mix of close-ups, medium shots, low shots, high shots, reverse shots, etc. Many serial directors simply dropped their camera in one place and let it go, always chopping spaces in half and enforcing a theatrical approach to mise en scene. An efficient but deadly dull modus operandi. Under the guiding hand of Witney and English, with the magnificent stunt work of Yakima Canutt and the good performance by Reed Hadley, Zorro's Fighting Legion emerges as one of the all-time greats. "We ride / With wind over hill, over dale / With a spirit that cannot fail / Men of Zorro are we. / We ride!"